Cost: $9 per bouncer, and adults are FREE! You don't need a special occasion to get your bounce on. 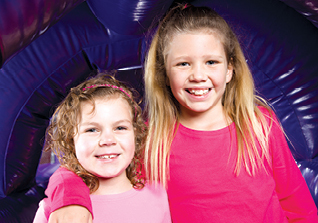 Give us a call and reserve your spot at our next All-Ages Open Bounce, then come by and enjoy our awesome inflatables, fantastic games, and wall-to-wall fun. You bring the socks - we'll take care of music, games, and everything else! And unlike some other places, we do NOT charge by the half-hour. Stay as long as you'd like. See you there! $9 per child and adults are FREE! The endless excitement of our inflatables and games is perfect for the whole family, and there's no better place to bond than BounceU. 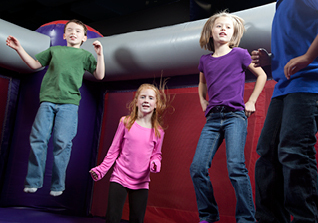 Whether you have two kids or 12, Family Bounce Night is easy, it's affordable, and it's fun for the whole family!